Seriously, who's still clicking these things? 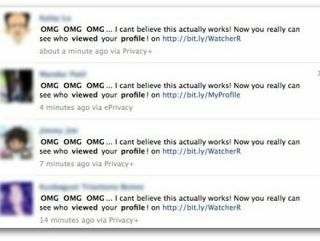 An application that claims to offer people the capacity to see who has been looking at their Facebook profiles is spreading virally and giving access to the accounts that are foolish enough to sign up to the scam. The message "OMG OMG OMG... I cant believe this actually works! Now you really can see who viewed your profile!" is whizzing across Facebook, as people try to sign up and give permissions to use their account. These Facebook scams are obviously very common, but this is a successful one purely because of the type of offer being made. People have been desperate to learn who is checking them out on Facebook since the site arrived, but is something that the social network (very sensibly) blocks. According to the Sophos security blog, this latest scam takes anyone who clicks the link though to the permissions page, and the moment people say yes to, effectively, handing over the keys to their social kingdom it will propagate the very link that the user had clicked on through their own account. It's an obvious scam, but it's likely to lure thousands into its obvious trap and once again reminds us that you cannot repeat enough the advice: "don't click random links offering suspiciously favourable things online".